Every year The Rainbow Times puts together a story about the main New England Pride organizations, their scheduled events, themes and all things Pride. This year is no different. Here is the latest news on these Pride celebrations. TRT: What’s this year’s theme? David Sullivan: Pride Portland! 2016 Theme is “Pride Through The Generations” Honoring*Celebrating*Creating. A: Our choices have not yet confirmed … they will be released on May 13, 2016, at our launch party. Q: What are you excited about for 2016? Do you consider your Pride to be inclusive and to have members of the LGBTQ community of color on your board? Pride Portland! Will celebrate 10 years of Pride starting on June 10. For more information visit www.prideportland.org/. BP: “Solidarity Through Pride.” Hundreds from the community participated in the vote that selected this year’s theme with many suggestions that touched on solidarity and the issues faced within the LGBT community. The theme encourages the LGBT community to see that there are multiple struggles in a wide range of communities, but are all related and intertwined. This is the first year that Boston Pride has had the same theme as InterPride, the organization that ties together Pride organizations across the globe. A: Grand Marshal: Claire Naughton of Foxboro, an LGBTQ ally and longtime activist for gay rights; Parade Marshal: Raffi Freenman-Gurspan, who works at the White House as an Outreach and Recruitment Director for Presidential Personnel and was the first openly transgender person to work in the White House and the first transgender legislative staffer to work in the Mass. Legislature; Honorary Marshals: The late Bayard Rustin, an activist for gay rights, civil rights, socialism and nonviolence. He organized the 1963 March on Washington, DC. and the late Thomas Barbera, a longtime labor and gay rights activist. Q: Do you have a current list of events? Why they are relevant in terms of your theme? What are you hoping to achieve at these events? A: Our events are listed on our website www.bostonpride.org and we are continually building the events for Pride Week and throughout the year. We anticipate having more than 40 Boston Pride events during Pride Week June 3 to June 12 that are open to all in the community. Our goal is, and has been, to provide safe spaces for the LGBT community and allies to celebrate the wonderful diversity of our community. Q: Last year, you were under widespread criticism from community members and the #BlackLivesMatter action for not being inclusive or sensitive to the needs of the LGBTQ communities of color. What are you doing this year to combat such a characterization? Has your board been diversified? A: Our board is diverse and includes black and Latino representation. Boston Pride always strives to be inclusive to all in the community: our organization has reached out, for years, to many other organizations that represent all components of the LGBT community. Our goal has always been to ensure that everyone in the LGBT community can celebrate during Pride Week, and to provide safe spaces for discussions around issues raised in the community. Our recent Community Forum on Intersectionality did that and we were pleased with the strong response with over 80 members of the community in attendance. We hope that this was just the start of a discussion on these important issues. We are stronger together, and it has been proven that things get done when we work together and people are in the room to contribute their ideas, express their concerns, and contribute solutions. Boston Pride Committee meetings have always been and will continue to be open to all: anyone can attend every Tuesday, at 6:30 p.m. at the Eastern Bank Community Room next to the Back Bay MBTA Station. Black and [email protected] Pride meetings are also open to all, every 4th Thursday, 6:30 p.m. at the Blackstone Community Center, 50 West Brookline Street, Boston. [email protected] Pride will be celebrated in September of this year. We are excited to have new three new volunteers to join the committee in 2016 who are eager to plan a full schedule of events celebrating Hispanic Heritage Month, which will include our annual [email protected] Awards & Reception. Q: What are you excited about for 2016 Pride Season? A: We are very excited about the 2016 Pride Season as we have already had several successful events, including Black Pride Week in February, and participation in the St. Patrick’s Day Parade and the Community Forum in March. There has been a great response of groups signing up to march in the Parade and to attend the Festival. We are looking forward to hosting, once again, one of the largest Pride celebrations in the U.S.
Boston Pride’s flag raising event will take place on June 3, 2016. The parade and festival will be on Saturday, June 11. For more information about these and other BP events visit: www.bostonpride.org/. TRT: What’s this year’s theme? Logo? A: Grand Marshal: The 76ers (Surviving participants of Rhode Island’s first Pride march in 1976); Honorary Marshal: Providence Mayor Jorge Elorza in recognition of his administration’s LGBT inclusive policies, particularly the expansion of full healthcare coverage to transgender city employees; and Honorary Marshal: PrYSM (Providence Youth Student Movement) in recognition of their 15th Anniversary and for their leadership in advocacy and political activism. A: Planning is still underway at this time. Dates for our annual Countdown to Pride events will be announced on our website (www.prideri.com). Currently confirmed dates include Gay Bingo on Thursday, June 16, 2016, and the annual VIP party/gala, on Friday June 17, 2016. Q: What are you excited about for 2016? A: RI Pride’s 40th Anniversary celebration is expected to attract the biggest and most celebratory crowds ever. As crowds have steadily increased over the past 4 years, our focus has been on streamlining our event logistics and placing public safety as a primary concern. We expect dramatic improvements in the festival layout this year and improved crowd control on the parade route that will provide an all-around better experience for fest and parade goers, as well as our volunteers who have been pushed to the limit in recent years in trying to keep up with the challenges the larger crowds bring. 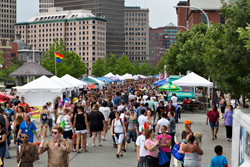 This excites us because it is evidence that PrideFest is a public celebration that is accepted and shared by an increasingly larger segment of Rhode Islanders, a marked difference from the original march and rally in 1976 that required a court order to be allowed to go forward as part of the state’s bicentennial celebrations. A: RI Pride’s eleven-member board is made up of members who are of color, trans, lesbian, gay, bi, and straight. There are currently two vacancies. Q: When (date) will RI PrideFest be this year? A: PrideFest will take place on Saturday, June 18th, 2016. The Festival will be at 12 p.m. on South Water St. For more information visit: www.prideri.com. HWB: Our theme this year is Building Community with Pride as we unveil our new logo and tag line. A: This year as we celebrate our 5th year anniversary we are choosing to honor North Shore Pride’s Fabulous Five. We have selected 5 individuals from the North Shore who have contributed to the advancement of Building Community with Pride. North Shore Pride is honored on this our 5 year anniversary to honor, in part, advocates from the Transgender and Bisexual North Shore community. Q: Do you have a current list of events? Why are they relevant in terms of your theme? What are you hoping to achieve at these events? A: On June 24, 2016 there will be the North Shore Pride Interfaith Celebration at the Tabernacle Church on Washington St. Salem at 7:00 p.m. On June 25, we’ll celebrate the North Shore Pride Parade and Festival in Salem, MA. The parade starts at Riley Plaza at noon. The Festival will be at the Salem Common from 12:00 to 4:30 p.m., showcasing over 75 vendors and a full day of family-friendly professional entertainment. Also on June 25 we will have the Official North Shore Pride Youth After Party. North Shore Pride is very happy to partner with NaGLY this year to offer a Youth After Party to be held at NaGLY located at Museum Place, 1 Church St. Salem, MA from 4:30-9:00 p.m. The event is open to youth from ages 13 to 23. On June 25 too, we’ll have the North Shore Pride Official Adult After Party. We are honored to hold the official North Shore Pride After Party again this year with our community partner, Murphy’s Pub, 300 Derby St. Salem, MA. The After Party will be held from 5:00-9:00 p.m. and all are invited to remain at Murphy’s throughout the night to the great sounds of DJ Andrea. A: 2016 has already been very exciting for NSP. As we celebrate our 5th year we reflect on our mission of education and advocacy for the LGBTQ in our community. North Shore Pride has worked diligently through the years to integrate ourselves as members of our business and citizen community. NSP is encouraged and proud to be engaged this year with, The Forum on Tolerance at North Shore Community College, Gordon College LGBTQ Students, The LGBT Asylum Task Force, OUTVETS, Vet to Vet, Montserrat School of Art, the Gay Straight Alliances (GSA) in both public and private North Shore Schools and The North Shore Chamber of Commerce among many. NSP has welcomed new business members to our LGBTQ community this year and we are very excited and honored to build relationships in our community as we provide education and advocacy on behalf of our LGBTQ community on the North Shore. Q: Do you consider your Pride to be inclusive and to have members of the LGBTQ community of color on your board? A: NSP works diligently to be welcoming to all persons. We have representation of our North Shore community both on the Board, in our committees and through our volunteer groups. We offer open Board meetings for visitors from the community who wish to attend our meetings and we offer a limited amount of scholarships to our events for those in need so that all groups and members of the spectrum are represented. Our Board diversity through the years has ranged from representation of persons of color; to democrats, republicans & independents; from straight to LGBTQIA … We welcome and ask any member of a our community who wants to be involved with NSP to please reach out to us and get involved. It takes an entire community to offer the events that we offer and we can always, always use new ideas and perspective. We take pride in learning each and every day as we talk and meet with others in our community in our efforts towards building our community with pride. North Shore Pride will take place on June 25, 2016. For more information visit: www.northshorepride.org. A: Since our Pride is in September, we have not yet determined our Marshals. A: We are looking forward to working with the multiple Worcester organizations to build on City Fest, a coordination of the multiple events being held in the City on Sept 10. We are also excited for our first ever “recovery brunch,” being held on Sept 11 (site to be determined). Q: Do you consider your Pride to be inclusive and to have members of the LGBTQ community on your board? A: We are a very inclusive Pride and have members of every community on the board. We have worked diligently over the last several years to position Worcester Pride as a family friendly and inclusive member of the entire Worcester community. A: Our Pride Week is Sept 7 – 11, 2016. NOTE: SPRINGFIELD PRIDE did not have their answers ready by the closing of the story, although multiple representatives were invited to participate. For more information about Springfield Pride, visit: https://goo.gl/fSeneS. NORTHAMPTON PRIDE: Northampton Pride Parade will open Pride Season in New England on May 7. TRT invited JM Sorrell, the organization’s listed spokesperson and Bear White, its Director, to participate in this story. No response was received for over two weeks, adding an extended deadline as well. All attempts were met without viable responses. For more information about Northampton Pride, visit: http://goo.gl/8M4kiM. Be the first to comment on "Pride Season in New England: Maine, Boston, RI, North Shore, Worcester & More"